Welcome to Our Wild Texas, TPWD's newest e-newsletter that brings you the latest on the wild things and wild places of Texas. You are receiving it because you subscribed to Life's Better Outside, the e-newsletter this one has replaced. You can change your subscriber preferences at any time. Enjoy this first issue and tell us what you think. The thorny brush of South Texas doesn’t seem a likely place to find such a beautiful animal, yet this is where the last ocelots in the U.S. survive. There are only about 85 ocelots left here, but trail cameras revealed 3 had kittens last year. 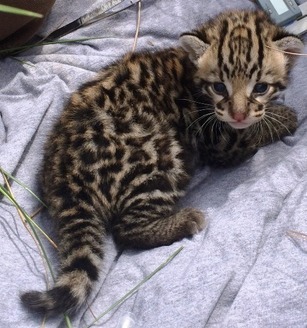 Then came the exciting discovery of the first ocelot den found at the Laguna Atascosa National Wildlife Refuge in 20 years – with a 3-week-old kitten in it. The biggest threats to these ocelots are habitat loss and vehicle traffic. Protecting habitat corridors, including through partnerships with landowners, is important to their survival. So are the wildlife tunnels recently constructed to get them safely across roads. Some of these tunnels even have raised sidewalks, so the wild cats don’t have to worry about getting their feet wet. If you see an ocelot, please report it immediately, whether alive or dead. The more we know about these elusive animals, the more we can do to help them survive. Some animals have a remarkable ability to adapt and flourish in cities, like the Dallas bobcats. But the survival of urban wildlife depends on humans. This video shows colonies of beneficial owls and bats getting a little help from their friends, as well as things you can do to help, like growing native plants. If you’re in Austin, Houston or Dallas/Ft. Worth, a fun way to discover your wildlife is to join in the City Nature Challenge, April 14-18. Just take a picture of a wild plant or animal with the iNaturalist app and the community will I.D. it. Then see which city records the most species. Join in and find out what’s in your city – or your neighborhood! A lot of the wildlife around cities lives near water. One way to catch a glimpse of these wild things is to get out on an urban Texas Paddling Trail. These trails are mapped, timed and tested for ease of paddling, and most have nearby boat rentals. In this first-person account, a woman paddles 20+ miles of trails in cities around Texas. She encounters blue herons, kingfishers, snowy egrets, sandpipers, snakes, turtles and more. She even got close enough to see an alligator’s webbed toes! Check the end of her story for a list of urban paddling trails (there's a new one in San Antonio), then plan your escape into nature. From now through summer, birds are raising their young. Keep these tips in mind if you discover a baby bird on the ground: first, put your pets away. If the chick hops and has lots of feathers, leave it alone. It’s probably learning to fly, and mom and dad are still feeding it. If you find chicks that don’t have many feathers, it’s OK to pick them up and put them back in the nest; their parents should return to them. If the nest is down or out of reach, this video shows how to make a substitute. But if the bird is injured, contact a wildlife rehabilitator. Texas is on the migratory flyway of over 300 bird species going south for winter. In spring, they turn around and come back through. Which means we’re in the perfect place and time for a birdwatching tournament! And the Great Texas Birding Classic is the biggest and best. Depending on how long you want to be in the field and your skill level, there’s a category right for you. This is a perfect excuse for hanging out in this gorgeous spring weather and looking at birds. Register by April 1. It starts April 15 and proceeds fund conservation projects. You are receiving this message at Email Address because you have done business with and/or signed up to receive email updates from Texas Parks and Wildlife Department. Sent from an unattended email inbox, using GovDelivery, the contracted email service provider of the Department. Do not respond to this email.